It's the year 2100, and Doctor Amami has discovered a new energy source, the extra-dimensional Rynax. But on Take-Your-Daughter-To-The-Top-Secret-Lab-Day, there's an accident that kills his child, Kurau. All is not lost, though, as Kurau comes back from the dead, but now she's become a Ryna-sapien, a human-alien mix with super-powers such as strength, flight, and disintegration. Eleven years later, she will work as a mercenary, where her secret powers give her the edge to support her rich lifestyle of penthouse apartments and expensive clothes. However, she's emotionally empty. The extra-dimensional Rynax must live in pairs, and Kurau feels alone without hers. One lonely night after wishing hard enough, Kurau's "pair" appears in her empty room, as a glowing and naked 13-year-old girl. Kurau names her "Christmas", and they spend the night together. Innocent as sisters or something more saucy? That's up to the audience. Kurau is all about the girl's love. Kurau's attachment to Christmas is histrionic - when the two are separated, they yell each other's name in the screeching manner that's all too common to anime. The powerful Kurau protecting the helpless Christmas will be repeated over and over. After a promising opening, Kurau Phantom Memory quickly becomes melodrama. Soon the police are trying to abduct Kurau and Christmas, because it might be embarrassing to discover that Rynax energy is actually enslaved energy beings from another dimension. There's lots of crying about how someone can't live with someone else, or about how someone has ruined someone else's life. Lots of tears are shed. Kurau Phantom Memory would make a much better live-action television show. The "future" furniture and houses either look exactly like 20th-century items, or are in the ridiculous "holographic iPhone" category. Real actors would be able to express themselves more, to move around in their environments. As an anime, Kurau has too much emoting from characters who can't change facial expression and who don't move a lot. The voice actors do the best they can, in both the English and Japanese versions. But inflection and tone are no substitute for lighting, motion, and directing - after so many episodes, the medium-shot that slowly pans through a room of stiff, crying characters can get overwhelming. As far as science-fiction goes, Kurau is laughable. 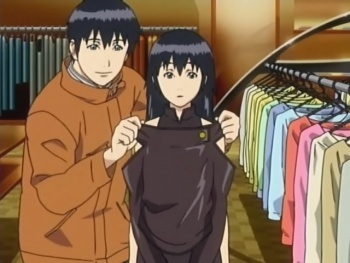 Twenty-first century face-recognition and data-mining are completely absent - in one episode, the fugitive Kurau appears on national TV and no one recognizes her. Even though the space-ships have "realistic" zero gravity ... several episodes set on a colony on Earth's moon completely ignore that gravity would be 1/6 normal - only Kurau is allowed to jump around, everyone else trudges like stormtroopers. The super-secret government police have better deus-ex-machina just bumping into the right people in the right place at the right time, rather than using any kind of police-work intelligence to track them down. Kurau is full of television logic that makes it hard to take the story seriously. Bottom Line: Kurau Phantom Memory lacks original ideas that have been done better elsewhere. Elfen Lied explored human vs. alien relations in a future society, with more surprises and more fan service. Ghost in the Shell: Stand Alone Complex has much, much better techno-thrills. And even Magical Girl Nanoha A's has better character building. As a lead-in to a better TV show coming on at 9:30, Kurau would be a pleasant diversion. But as a brick of nine hours of DVDs? Recommendation: If by the first two episodes of Kurau Phantom Memory, you've made enough an emotional investment in these two oneesama energy beings, then you might consider watching the rest of the series. But if you aren't engaged halfway through Episode 3, it's highly unlikely you'll want to stick around for another 480 minutes. Norman Rafferty is normally shy and sensitive to a fault, but frequently has been known to display a ferocious temper and is prone to extreme jealousy when Sakaki is involved.